If one can identify any trend in today’s diverse design, it would be the new flirtation with geometrical forms and solid colours. Die Gestalten are to release a new book in September that documents this development and is accordingly called NeoGeo: A New Edge to Abstraction. Basic forms such as circles, squares and triangles are being increasingly used in creative work. One sees crystalline structures, diamonds, rhombi, patterns and grid-like frames. Elements influenced by the psychedelic and OpArt of the 1960s and 70s are being combined with the acid colours of the late 80s. 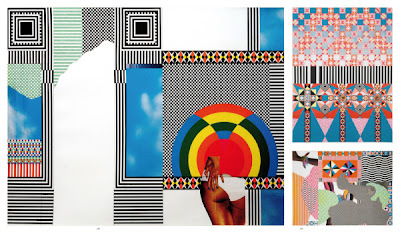 NeoGeo makes clear that this current abstract work is not a nostalgic phenomenon; rather, it borrows from illustration, collage, typography and computer art to create a whole new visual language.